Kyle holds the Timnick Chair in the Humanities in the Department of Philosophy at Michigan State University. He is a faculty member of the Environmental Philosophy & Ethics graduate concentration and serves as a faculty affiliate of the American Indian Studies and Environmental Science & Policy programs. 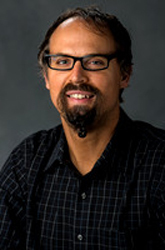 His primary research addresses moral and political issues concerning climate policy and Indigenous peoples and the ethics of cooperative relationships between Indigenous peoples and climate science organizations. He is an enrolled member of the Citizen Potawatomi Nation. His articles have appeared in journals such as Climatic Change, Sustainability Science, Environmental Justice, Hypatia, Ecological Processes, Synthese, Human Ecology, Journal of Global Ethics, American Journal of Bioethics, Journal of Agricultural & Environmental Ethics, Ethics, Policy & Environment, and Ethics & the Environment. Kyle’s work has been funded by the National Science Foundation, Bureau of Indian Affairs, U.S. Fish and Wildlife Service, Northeast Climate Science Center, Great Lakes Integrated Sciences and Assessments Center, Mellon Foundation, Sustainable Michigan Endowed Program and Spencer Foundation. He serves on the U.S. Department of Interior’s Advisory Committee on Climate Change and Natural Resource Science and is involved in the Climate and Traditional Knowledges Workgroup, Michigan Environmental Justice Coalition, Everybody Eats: Cultivating Food Democracy, Humanities for the Environment, the Consortium for Socially Relevant Philosophy of/in Science and the American Philosophical Association Committee on the Status of Indigenous Philosophers. Climate and Traditional Knowledges Workgroup (CTKW). 2014. Guidelines for Considering Traditional Knowledges in Climate Change Initiatives. https://climatetkw.wordpress.com. Holtgren, M., Ogren S., & Whyte KP. 2014. Renewing Relatives: Nmé Stewardship in a Shared Watershed. In Tales of Hope and Caution in Environmental Justice. A website for the Mellon Humanities for the Environment initiative. Whyte, K.P. 2013. On the Role of Traditional Ecological Knowledge as a Collaborative Concept: A Philosophical Study. Ecological Processes. 2(7): 1-12.